The 30-year U.S. treasury bond index rallied up to a 52-week high within a 7-month bullish uptrend channel. The S&P 500 index rebounded with intermediate wave B which is the middle part of an intermediate A-B-C corrective phase. The biotech, semiconductors, and precious metals sectors are ranked at the top of the sector performance for last week. Our major global market performance ranking has the Hong Kong stock market at the top and the German stock market at the bottom for last week. The broad stock market is projected to be in a short-term bullish time-window until 8/26/2014. The following table is the percentage change of sectors and major market indexes against the 89-day exponential moving average (EMA89). 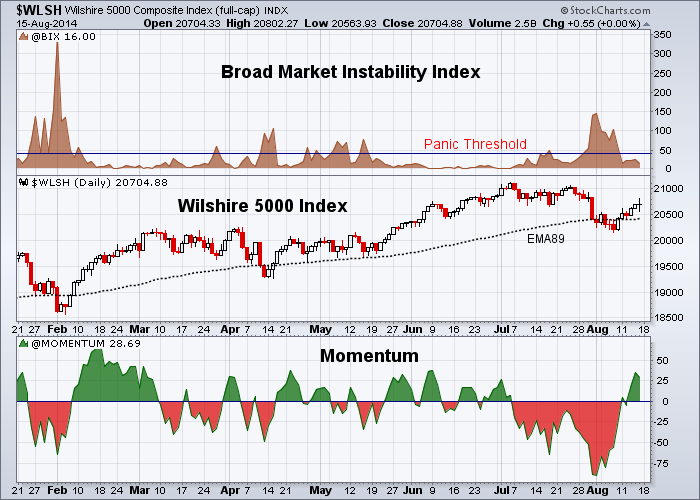 The Wilshire 5000 index, as an average or a benchmark of the total market, is 1.39% above the EMA89. Outperforming sectors are Biotech (8.88%), Semiconductors (6.00%), and Precious Metals (4.11%). Underperforming sectors are Wireless Communication (-5.96%), Home Construction (-4.22%), and Banks (-1.24%). This primary wave  is expected to have an intermediate (A)–(B)–(C) corrective wave structure. The decline in late July and early August is intermediate wave (A) which is the first downward leg of primary corrective wave . Currently the S&P 500 index rebounds with wave (B). Please note that this (A)–(B)–(C) correction could become a flat correction when wave (B) goes near or beyond the starting level of wave (A). The German DAX index has a similar Elliott Wave structure to the S&P 500 index. It has broken below the lower boundary of the rising wedge (Ending Diagonal). Now it is in primary wave , and intermediate wave (B). From our “Major Global Markets Performance Ranking” section, you can find that the Germany stock market last week is ranked as a worst performer again just next to the Russian stock market. The table below is the percentage change of major global stock market indexes against the 89-day exponential moving average (EMA89). Currently Hong Kong market is outperforming. The German market is underperforming. The U.S. dollar has formed a 9-month trading range between 79.2 and 81.5. It is neutral before a breakout from the trading range. Now it is testing the upper boundary of the trading range. The following chart is a daily chart of the 30-year U.S. treasury bond index. The index is forming a 7-month bullish uptrend channel. Currently it is at a 52-week high. The gold index is forming a 7-month symmetrical triangle pattern. It is neutral before a breakout from the triangle. It is most likely that prices may further break through the upper boundary of the symmetrical triangle to the upside. We maintain our upside price target 1400 for the medium-term. Crude oil is forming a 2-month downtrend channel. It is bearish before prices break above the upper boundary of the channel.